This text introduces and draws together pertinent aspects of fluid dynamics, physical oceanography, solid mechanics, and organismal biology to provide a much-needed set of tools for quantitatively examining the biological effects of ocean waves. "Nowhere on earth does water move as violently as on wave-swept coasts," writes the author, "and every breaker that comes pounding on the shore places large hydrodynamic forces on the organisms resident there." Yet wave-swept coral reefs and rocky shores are home to some of the worlds most diverse assemblages of plants and animals, and scientists have chosen these environments to carry out much of the recent experimental work in community structure and population dynamics. Until now these studies have been hampered because biologists often lack a working understanding of the mechanics of the wave-swept shore. 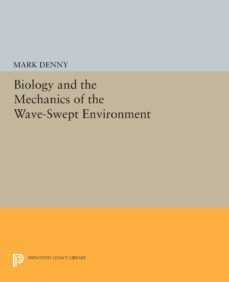 Mark Denny here supplies that understanding in clear and vivid language.Included are an introduction to wave-induced water motions and the standard theories for describing them, a broad introduction to the hydrodynamic forces these water movements place on plants and animals, and an explanation of how organisms respond to these forces. These tools are put to use in the final chapters in an examination of the mechanisms of "wave exposure" and an exploration of the mechanical determinants of size and shape in wave-swept environments.Originally published in 1988.The Princeton Legacy Library uses the latest print-on-demand technology to again make available previously out-of-print books from the distinguished backlist of Princeton University Press. These paperback editions preserve the original texts of these important books while presenting them in durable paperback editions. The goal of the Princeton Legacy Library is to vastly increase access to the rich scholarly heritage found in the thousands of books published by Princeton University Press since its founding in 1905.